Orlando Bloom already has the classic Hollywood looks , but now he is steadily getting the body too. The Three Musketeets actor was seen looking rather more pumped than he used to as he left the gym in Los Angeles on Friday afternoon. The 36 year old is becoming well know for his healthy and active lifestyle and the results of his regular fitness training are reall starting to show. Orlando may have had his upper body covered up , but there was no hiding his bulky physique. The actor wore a great zipped up hoody with a pair of black shorts and same colourful blue and yellow trainers. His biceps were still visible as he bent his arm up and the star must have put some serious work in on his chest which also looked chiseled through the hoody. Rather than head straight home and rest his tired body Orlando decided to do a bit of shopping in West Hollywood. With such a recognisable face the father-of-one avoided being mobbed by screaming fans by hiding slightly under a trucker cap. The headgear couldn’t tame his wild brown locks but it did the trick and kept him incognito as he shopped around Sunset Plaza. The British star was perhaps picking up some things and running errands for his wife Miranda Kerr who should be taking things easy at the moment. The 29-year-old model was injured in a crash on Monday, which saw her vehicle ‘rammed’ by another car on the motorway in the city. 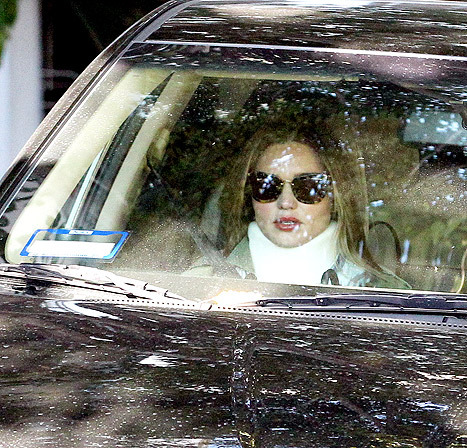 She is believed to have suffered back injuries in addition to whiplash.